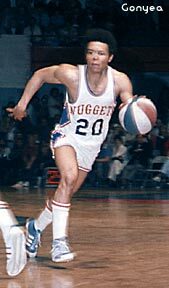 Did you see an ABA Nuggets game? 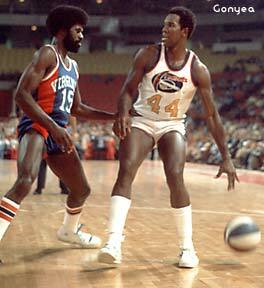 Or, did you have a favorite ABA Nuggets player? Contribute to this web page by describing your favorite ABA Nuggets memories. The Denver Nuggets were "born" in the summer of 1974, from the disarray of the Denver Rockets. 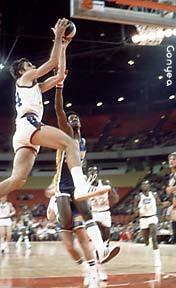 The Rockets had existed since the beginning of the ABA. The Rockets occasionally had good attendance, but rarely succeeded on the court. Many Rockets fans had become disenchanted with the team when super-rookie Spencer Haywood abandoned Denver for the Seattle Supersonics of the NBA in 1970. In the summer of 1974 new owners bought the team and got rid of Alex Hannum as the franchise's coach and general manager. The new coach was suddenly Larry Brown, who had played for Denver from 1970-72. Brown was willing to leave North Carolina because the Carolina Cougars franchise was moving to St. Louis. Brown also brought along Carl Scheer, as the general manager, and Doug Moe, as assistant coach. A contest was held to find a new nickname for the franchise--the name "Nuggets" won, the same name that had belonged to Denver's short-lived NBA franchise in the 1940's. The new logo was an excited miner ("Maxie the Miner," above) who had apparently just discovered an ABA Ball. This was a subtle suggestion to Denver residents that their "New Denver Nuggets" were suddenly different and interesting. Incredibly, due to the presence of Brown and Moe, they were. In one summer, Brown and Moe transformed the Nuggets from a problem franchise to a red-hot commodity. With the North Carolina connections of Moe and Brown, the Nuggets were able to accomplish something significant: they drafted and signed defensive-minded Bobby Jones from Dean Smith and the North Carolina Tarheels. Jones chose the Nuggets above the Houston Rockets of the NBA. All-Star guard Mack Calvin also followed Brown and Moe from Carolina to the Nuggets. With Jones and Calvin, plus the same cast of players that had achieved a disappointing 37-47 record the year before (Byron Beck, Ralph Simpson, Dave Robisch, Claude Terry, and Mike Green), the Nuggets became the best team in the ABA. Virtually every home game in their small arena (the downtown Auditorium Arena) was a sellout. The 1974-75 Denver Nuggets surprised everyone by running away with the ABA Western Division crown. But they did so for good reason. Feisty guard Mack Calvin (above middle, #20) had one of his best years ever, averaging 19.5 points and a league-leading 7.7 assists per game. Rookie Bobby Jones (above left) arrived from the North Carolina Tarheels, choosing to sign with the Nuggets instead of the Houston Rockets of the NBA. Jones gradually gained the attention of the entire league during his rookie year. 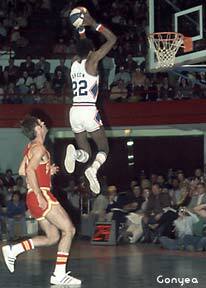 His defense was spectacular, and his leaping ability amazed everyone. He topped the ABA in field goal percentage with a .604 mark. At the end of the 1973-74 season, guard Ralph Simpson (at left, #44, with the vicious dunk over Virginia's George Irvine) had demanded a trade out of Denver, citing a personality conflict with coach Alex Hannum. But playing in Larry Brown's "passing game" system resurrected Simpson's career. During the 1974-75 season, Simpson averaged 20.6 points and 5.4 assists per contest. Center Mike Green (above right, #22) had his best year as a pro, averaging 17.4 points and 9.2 rebounds per game. Calvin, Simpson and Green all played in the 1975 ABA All-Star Game at San Antonio. Their coach in that game? Larry Brown got the honor due to the Nuggets' stellar record. While the Nuggets had professional basketball's best overall record in 1974-75 (65-19), their most impressive accomplishment was their regular season record at home: 40-2. Until the 1985-86 Boston Celtics lost only one game at home, the Nuggets' 1974-75 home record stood as the all-time best professional mark. However, the Nuggets stumbled in the playoffs, losing three home games in their second round series with George McGinnis and the Indiana Pacers. Determined to go further in the playoffs in 1976, the Nuggets contented themselves by signing collegiate superstars David Thompson and Marvin Webster. Both of these players had been drafted by the Atlanta Hawks of the NBA (Thompson--#1 pick overall, Webster--#3 pick overall). 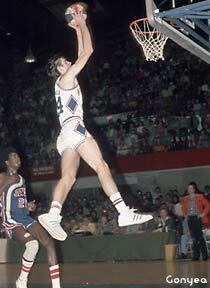 The Nuggets also traded Dave Robisch to obtain all-star forward/center Dan Issel from the disorganized Baltimore Claws. Even though Webster was out almost the entire 1975-76 season due to hepatitis, the Nuggets were the most dominant team of the ABA. Playing in their new 18,000 seat McNichols Arena, the Nuggets ran up a 60-24 record, even though five of the six remaining teams were deep and talented. The Nuggets even beat the rest of the league's All-Stars in the 9th Annual ABA-All Star game, which set records for attendance and interest. In his spectacular rookie season, Thompson won the MVP award in that game, as well as the overall Rookie of the Year award in the ABA. The Nuggets front line during their last ABA season was a future Hall-of-Fame combination: David Thompson, Dan Issel, and Bobby Jones, and their attendance was spectacular, even by NBA standards. The 1975-76 Nuggets were one of the best ABA teams ever assembled. In fact, they were probably one of the best professional basketball teams of all time, even though they faltered in the 1976 ABA Finals. The team boasted two Hall of Fame players, Dan Issel (above right, #25) and David Thompson (above left, #33, dunking over George Karl of the Spurs). Ralph Simpson (right, #44) had another career year playing for Larry Brown. And Bobby Jones (above middle) continued to amaze ABA fans with his overall play. While the Nuggets once again dominated the rest of the league during the 1975-76 regular season, they ran into another buzzsaw in the playoffs. After disposing of defending champion Kentucky in their first series, the Nuggets ran into the New York Nets and a healthy Julius Erving. Aside from Bobby Jones, the Nuggets had no physical players to contain Erving, and lost the Championship Series 4 games to 2. However, with their talent and healthy attendance record, the Nuggets were a part of the NBA merger. In their first NBA year, the Nuggets surprised no one by winning 50 games and the NBA's Midwest Division crown. Sadly, longtime ABA and Nuggets trainer Chopper Travaglini passed away in June 1999. In the June 19th edition of the Denver Post, Mike Monroe paid tribute to Chopper's legacy. There he was, standing on the runway of the Pittsburgh airport trying to flag a plane down (not a cab, a plane). What's a nice trainer doing in a place like this? Well, if you knew the subject in question was Bob Travaglini, you'd know there would be a good explanation. Read Leo Hirsch's 1976 article about Chopper, the ABA's most beloved trainer. Brett Ballantini's April 1999 interview with Dan Issel. Before 1975, Dan Issel and the Kentucky Colonels went together "like the Horse and Carriage, bread and butter, salt and pepper." But in October 1975, the Colonels sold Issel to the Baltimore Claws for $500,000. 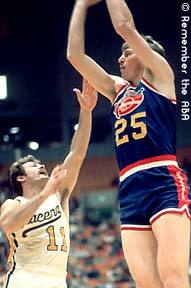 A few weeks later, the disorganized Claws traded Issel to Denver, where he played for nine straight years. How did Issel react to all of this upheaval at the time? Read "Issel and the Nuggets" by Dan Pattison. The famous slam dunk contest held at halftime of the 1976 ABA All-Star Game in Denver was one of those serendipitous decisions that was typical of the ABA, a maverick league that seldom planned anything too far in advance. It was an act born of desperation, but desperate times demand desperate measures. And the ABA was in decidedly desperate times. 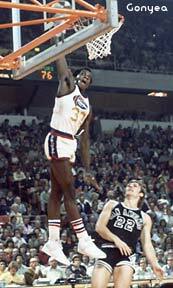 Read all about the dunk contest in Michael Murphy's comprehensive article about the ABA: "The ABA Way." In the Fall of 1976, the Nuggets played their very first games in the NBA. In November 1976, Bill Hirsch interviewed Nuggets coach Larry Brown to get Brown's first impressions of the league with the "ugly-colored brown ball."